NEW YORK (AP) — Anthony Joshua was welcomed by applause on the stage. He stood front and center, promoting his Sept. 22 bout against Alexander Povetkin. Even there, he couldn't escape talk of the heavyweight he isn't fighting. Someone in the crowd jumped at the opportunity and shouted, "AJ, we want Wilder!" "Let them train to be a fighter and fight (Deontay) Wilder," Joshua told AP. "It's easy talking about it. It's another thing doing." But with his hands on his hips, Joshua looked in the direction of the outburst and stoically mouthed, "Same." Meanwhile, Povetkin was standing off to the side. Povetkin and Joshua were both in the West Village on Tuesday for the launch party of DAZN, a global sports streaming service. Its first event is their fight. Povetkin is partially the reason why Joshua (21-0, 20 knockouts) isn't fighting Wilder (40-0, 39 KOs) this year. 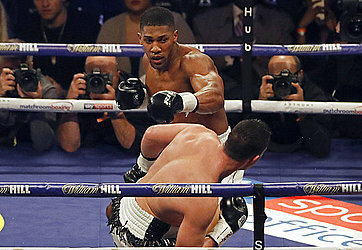 In June, the World Boxing Association ordered Joshua to fight Povetkin (34-1, 24 KOs) or have his title stripped away. He signed, ending his chances of a Wilder-Joshua fight in 2018. Wilder said if Joshua wanted the fight to happen, it would be happening. "Most definitely he could have gotten an exemption for this fight," Wilder said. "That was the least of the worries right there because everyone wants it. When everyone wants it, then there's nothing that could stand in the way of a fight of this magnitude. No possible way. "Even when he's announcing Povetkin, they're talking about me. Everywhere we go, they're talking about this fight." But Joshua doesn't care what everyone wants. He said he's following protocol. "This career isn't determined by what people want," Joshua said. "It's my career. I've always pulled for and done what was right for myself, which has ultimately led me to becoming a champion." Right now, Joshua holds three of the four major belts: WBA, IBF and WBO. Wilder has the other: WBC. If the two were to fight, which they still both believe they will, the winner would be named the undisputed heavyweight boxing champion. The most recent boxer to claim that honor was Lennox Lewis in 2000. "It's not about the big light," Joshua said. "It's not about taking from the industry. I don't want to drive a Rolls-Royce tomorrow. I don't want a one-hit fight wonder, then I'm a champion one week and few months later I've lost it because I'm living the life. I want to add to the industry, give back. I do it because I'm passionate about it." His passion is just different from Wilder, who said he tried everything possible to make this unification fight happen. Wilder accepted a flat fee of $15 million and offered Joshua a guaranteed $50 million, plus 50 percent of the revenue if the fight took place in the U.S. Joshua wanted England. Wilder agreed. "We've done everything," Wilder said. "I can't express how much I mean by that when I say we've done everything day and night, day and night, day and night. And the only thing they've done is try to come up with plans of distracting the fans and trying to come up with plans of lies." More negotiations took place. Each side says something different transpired— Wilder said Joshua sent blank contracts missing a date or place; Joshua said Wilder didn't meet the deadline. There was also a disputed rematch clause. Regardless, months passed without any signed contract, leading the WBA to step in. Wilder thinks Joshua would rather fight Povetkin anyway because he's not ready to compete against the best. "Wilder has a big power punch, but he likes to fight. He likes to get into the brawl a little bit," Povetkin said through a translator. "Joshua is more technical, but he also has a lot of power. It would be a different approach, but they're both great fighters." If Povetkin defeats Joshua, the unification discussion might change. Only time will tell. Both parties say they want it to happen. It's just not happening this year. Joshua has Povetkin at Wembley Stadium in London. Wilder says he will also have a fight and to be on the lookout for an announcement soon. Life is moving on — for now. "At the end of the day, me and Joshua don't need each other," Wilder said. "Not to survive and live. We've been doing that before we even met each other, and we're going to do that after we've met each other. 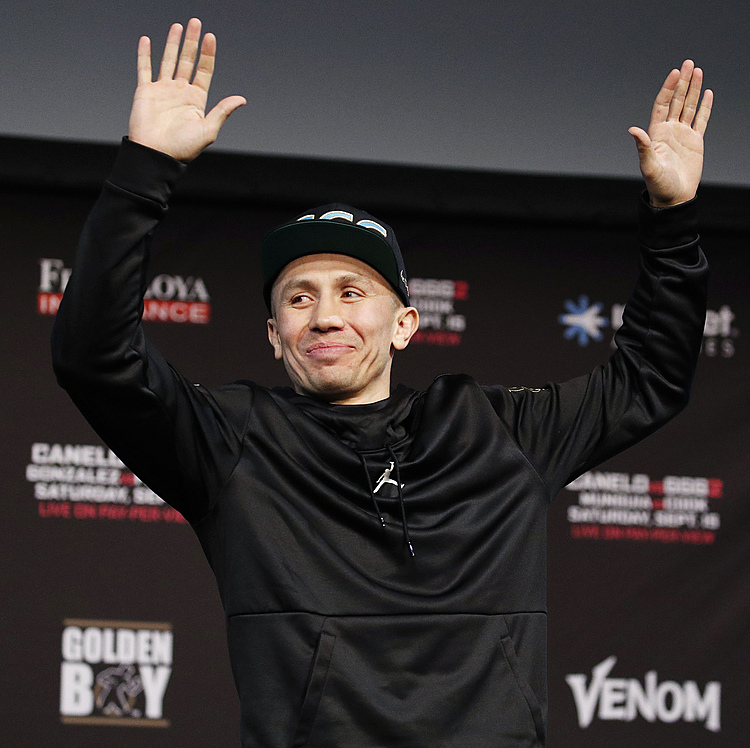 "But for this fight to happen — for fans to see one of the biggest fights in world history and to see one champion, one face, one name — we definitely need each other."